I have selected this recipes for you because i find it really original and it look delicious! wash the figs and remove the skin, cut into 4 and put them in the blender with the Marsala wine and a tablespoon of honey. You will get a mixture not very liquid. Put it in the refrigerator. Beat by hand with a whisk the egg yolks with the sugar. Add half a teaspoon of Marsala and stir. Then add the mascarpone, ricotta and honey and mix well again with the whip. Whip the whites until stiff with a pinch of salt and incorporate gently stirring from the bottom up to the mixture of mascarpone and ricotta. Arrange the walnuts on a baking sheet. In a saucepan, pour the sugar and water. Cook until the sugar has melted and has taken on an amber color. Immediately pour the caramel over nuts and let it solidify. Put it in the fridge for 5 minutes. In a saucepan, pour the sugar and water. Cook until the sugar has melted and has taken on an amber color. Immediately pour the caramel on a sheet of parchment paper and let it solidify. Store in the refrigerator for 5 minutes. Assemble the tiramisu placing the bottom of a baking dish a little bit of cream, then the ladyfingers soaked in wet, some fig cut into slices and then the cream. 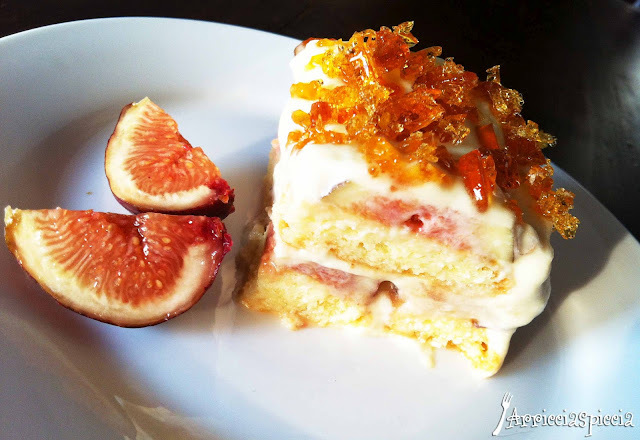 Make another layer of ladyfingers-figs-cream and finish with the caramel crisp.